Barbecue feasting under the stars! 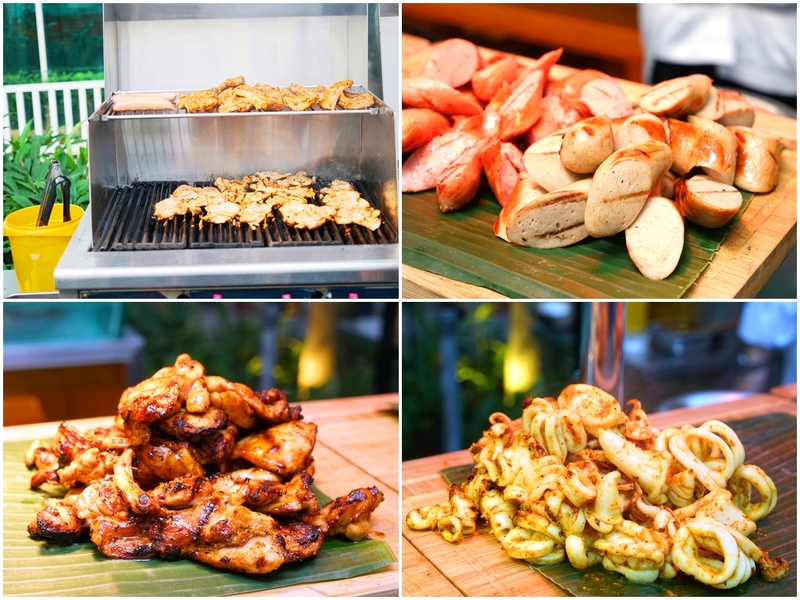 That's exactly what we did just a few moons ago when we had a firsthand preview of Cocobolo Poolside Bar + Grill's revamped weekend barbecue buffet menu. Come 30th September 2016, the new menu will feature an upsized variety of premium meats and seafood items, along with an expanded selection of appetizers and hot mains. I initially thought Park Hotel Clarke Quay is situated at Clarke Quay itself, but its location is actually nearer to the Robertson Quay area where Robertson Walk and UE Shopping Mall are. Oops, almost lost my way haha. 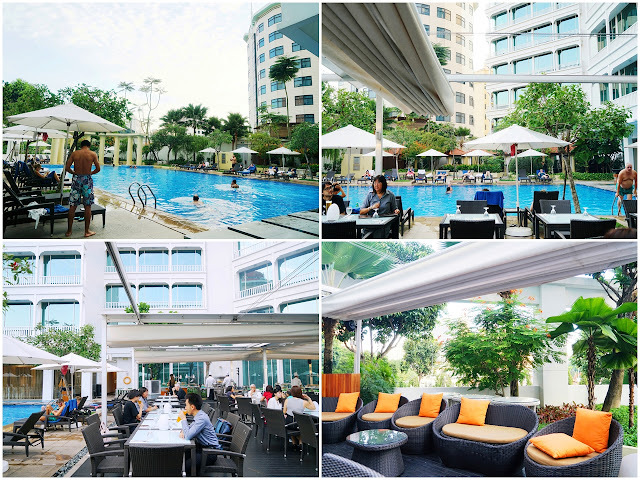 Cocobolo is the alfresco restaurant nestled on level 2 of the hotel, right next to the swimming pool with a nice view and surrounded by lush greenery. But one thing is for sure: You will see a number of chefs sweating busying over at the barbecue station, skilfully grilling the meats and seafood, and preparing an array of food to feed our appetites. Erm... "hot" chefs? I prefer hot food haha! 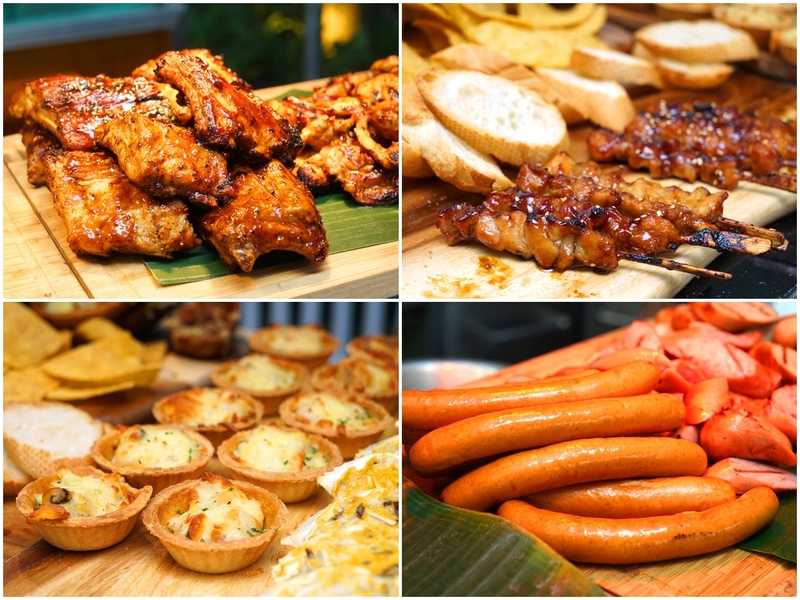 The sound of sizzling meats and smell of smoky flavors certainly had us salivating. 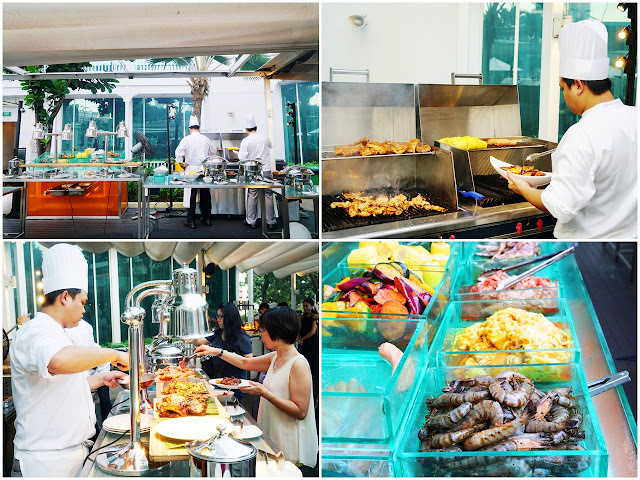 In addition to the buffet's signature New Zealand Angus Striploin, Australian Rack of Lamb seasoned with rosemary and dijon mustard, US Baby Back Ribs in spicy Chipotle sauce, there are also crowd-pleasing Cajun-spiced Tiger Prawns and Tumeric-laced Arrow Squid. Love the squid which was done to an ideal succulent bite. The lamb was also of such lovely tender deliciousness that it had my dining companions going back for repeated servings. We thought the beef steak were a tad overcooked and only realized later that we can actually make a request to the chefs to grill it to our preferred doneness, just that we have to wait for a while for it to be ready. Aiyah too late, as my tummy is already loaded with those pieces of moreish Gourmet Sausages (I love sausages!). Stand-out also includes the Grilled Mackerel Fish in Banana Leaf, which was very flavorsome and had a subtle spiciness that was very pleasing. 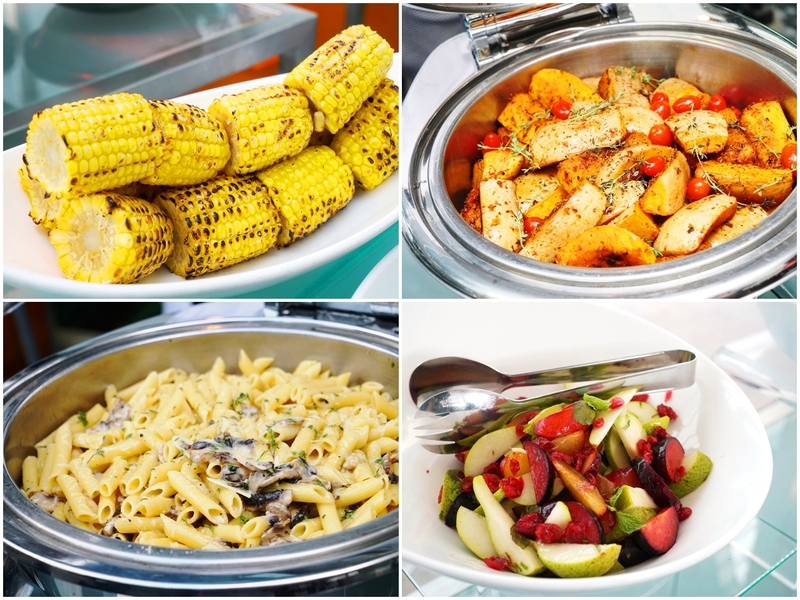 A wide range of side dishes such as Roasted Pumpkin Wedges, Bacon & Cheddar Spud Skin and Teriyaki Chicken Skewers are also available to complement the barbecue specialties. For something refreshing, there are the Prawn & Avocado Salad, and Parham Pear & Plum Salad with Mint Dressing. The Grilled Pineapples are definitely not to be missed! Its caramelized sweetness and light tartness was not only enjoyable, it also cleansed the palates and cut through any greasiness effectively. 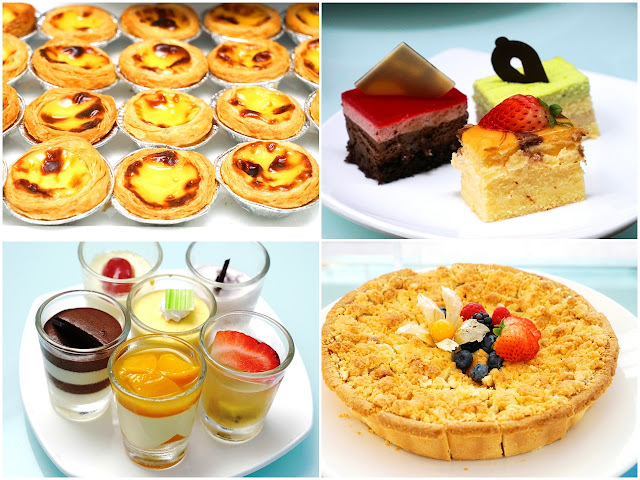 To round up dinner on a sweet note, there are dessert offerings of Apple Crumble Pie, Caramelized Pear Tart, Chocolate Raspberry Cake, New York Cheesecake, Green Tea Chestnut Mousse Cake, as well as Portuguese Egg Tarts. Check out the Mini Magnum and Cornetto Ice Cream Cones too! We were blessed with breezy wind for most of the evening, but my advice is to wear light clothings and get a table as far away from the buffet setup as possible, for it can get rather smokey and warm at times too. The Barbecue Buffet Dinner at Cocobolo Poolside Bar + Grill is available every Friday to Sunday, starting 30th September 2016, 6.30pm to 10.30pm. Price is at $57++ per adult, and $28.50++ for children betwwen 6 and 12 years old. Inclusive of a glass of draft beer. Prices are (1) Stated in Singapore dollars (2) Subject to 10% service charge & 7% GST (3) Correct at point of published date.